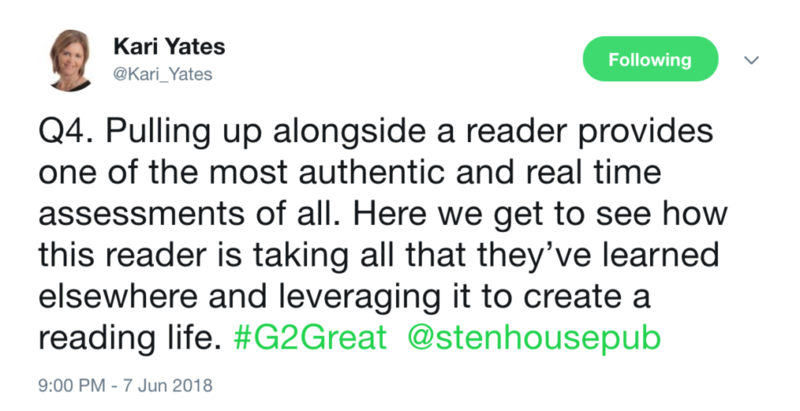 June 7, 2018, marked an extraordinary day in #G2Great history. We celebrated the collaboration between two friends who met in this very community, Kari Yates and Christina Nosek. Their collaboration has resulted in an important new book from Stenhouse: To Know And To Nurture a Reader: Conferring With Confidence and Joy I know that Amy, Mary, Fran, and I are all looking forward to having this book (just in time for summer learning) in our hands! Conferring is synonymous with growth – growth for students and growth for us. It gives us opportunities to grow language, community, and potential. The words are warm and inviting – there are no wrong answers. This language is not “high stakes” it is “high impact”. These words denote wonder and caring. This language places a value on the learner and the process; not the task and the product. 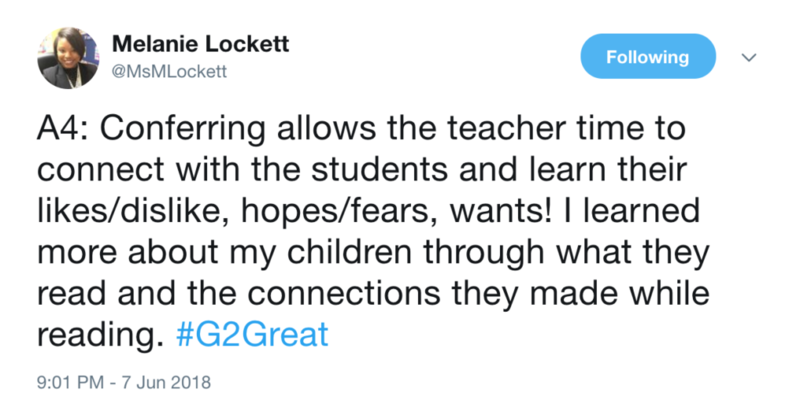 This is why we became teachers. Everyone wants to belong. When we build up community founded on trust conferring can be transformative. We are teaching our students something essential, everyone has a voice and we need each other to learn and grow. We need emotional safety in order to take intellectual risks. Whenever we make the decision to be fully present and to listen we are helping our students to know their value. Through this exchange that conferring offers, students are also learning to value what we have to teach them. Conferring reveals who we aspire to become. This is as true for us as it is for our students. Conferring helps us to clarify what we understand about students so that we can bring that awareness back to them. Our conversations are the foundation for critical thinking. Together we are all learning to be objective and analytical. This is how we can make complex judgments in the day-to-day work of being a teacher or a student. My last words to you are that our conversations are important. Words matter. The work we do learning with each other is a gauge for how far we can stretch ourselves to know and to be more than we are today. The work of conferring rests on subtle choices we make in an instant. That can be quite daunting! Kari and Christina wrote this book as an invitation for us to lean into this work. Conferring can be comfortable and powerful. Doesn’t that sound great? It truly is and it really can be when we start from a position of joy. When there is joy, confidence follows. Thank you, Kari and Christina, for sharing your wisdom and leading the way.